Caesar salads are one of my favorite kinds of salad. The cold, crisp romaine lettuce, the tangy, creamy dressing and the decadent, long slivers of Parmesan cheese on top combine to make a simple but thoroughly enjoyable appetizer or meal in itself. So, with some recently purchased Worcestershire sauce on hand, I decided it was time to try making it. To coddle an egg, boil a small pot of water and then put a fresh egg into it for exactly 45 seconds. Remove the egg from the water and then let it cool off for about 8 to 10 minutes. In the meantime, mix the Worcestershire sauce, mustard, lemon juice, garlic and salt and pepper in a bowl. Crack the coddled egg into the bowl, and then whisk until smooth. Next, add the olive oil into the bowl – slowly – while whisking, to emulsify the mixture. Preheat the oven to 350 degrees. Cut the baguette into 1/2 inch cubes and put into a bowl. Add the garlic, paprika, olive oil, and salt and pepper, and then mix well. Put the bread crumbs on a baking sheet and bake until golden brown. I used a par-baked baguette from TJs, and it took about 10 minutes. Refrigerate the serving plates and forks. When you are ready to serve, sprinkle some lemon juice and a few drops of Worcestershire sauce on the romaine lettuce. Then, add half of the dressing, toss well and then add the rest of the dressing along with the croutons. Top with the Parmigiano-Reggiano cheese and then serve. Apparently, the creator of the Caesar salad, Italian chef Caesar Cardini, originally served the salad on whole romaine lettuce leaves, so diners could pick up a leaf by its short end and eat it bit by bit. That seems like a fun way to eat the salad. Also, the original recipe didn’t have anchovies, which is just fine by me. The dressing tasted great when I made it, but I prefer it to be creamier. Next time, to thicken the dressing, I’ll try adding some more mayonnaise or perhaps another egg. 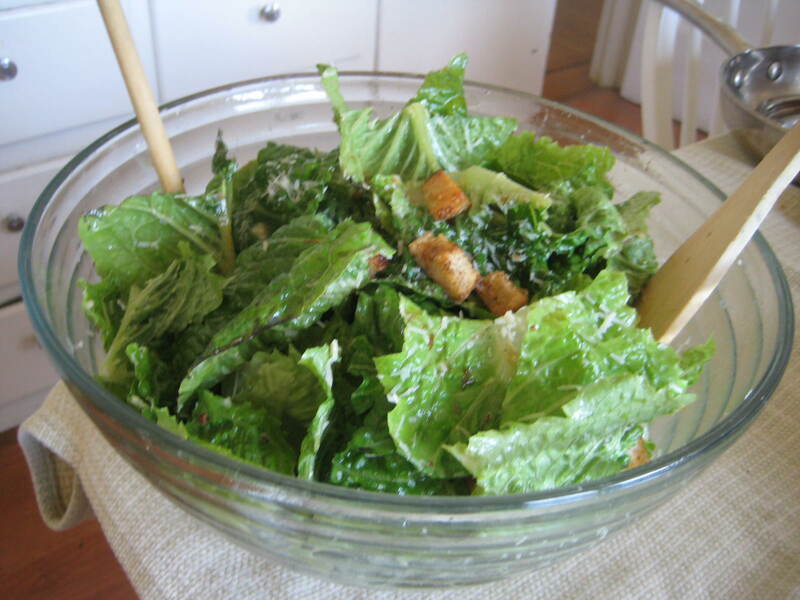 This entry was posted in American, Recipes, Salad and tagged Caesar Salad, Dijon Mustard, Worcestershire Sauce. Bookmark the permalink. Yuumm!! Thanks for sharing the recipe.